Starting to play violin at the young age of 10, Quike has made his passion his profession and now has over 12 years experience in playing the electric violin and performs at world renown venues such as Nikki Beach worldwide, Faces in Essex, UK, The Timi Ama Resort in Italy and more. He has the energy, the looks and the professional attitude to make any event a total success. His Electric wireless violin allows him to play from anywhere in a room, so he will be guaranteed to entertain your invited guests. Quike Navarro is a world-class house violinist/showman, he has performed in 3 continents and in the most prestigious clubs of Spain, Morocco, Cyprus and The United Kingdom. 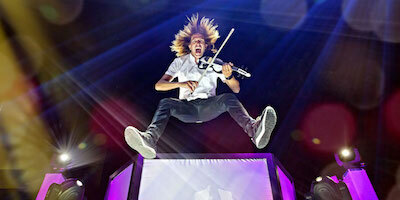 With his electric violin, laser bow, and unlimited energy, he puts on a show that will blow you away. 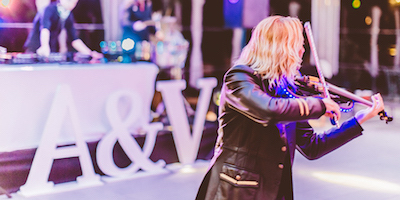 Enjoy the electric sounds of Quike’s violin during your wedding reception. Booking the Gold Who Killed the DJ package, Quike will perform during your reception to your guests while you take pictures. Quike Navarro is guaranteed to liven up your event regardless if its an intimate family event or corporate event with hundreds of invited guests. Quike’s instruments are wireless meaning he can join the crowd and entertain from any corner of the room! Quike Navarro is a house violinist originally from Spain. Having played for many famous artists such as Michel Rodriguez from the Fast & the Furious, Antonio Banderas and DJ Tiesto to name but a few, Quike is considered one of the most sought after house violinists in the world. Quike started playing the violin when he was just 10 years old, and has made a carreer out of his passion ever since. He is asked to perform at many great events, his personal favorite has to be the opening party of Nikki Beach in Dubai. Quike is a well known artist performing at Nikki Beach venues including Nikki Beach Marbella, Mallorca & Dubai, but is also often invited to the world famous Olivia Valaire Club in Marbella, Amnesia Rabat in Morocco, Kube Madrid or Faces in Essex (UK). Having performed at over 500 weddings, quike knows how important it is to make an impact on a wedding day. 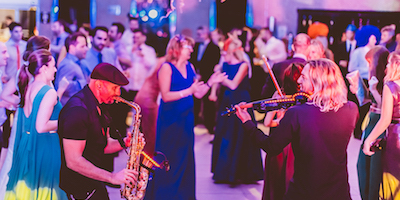 His repertoire includes playing romantic ceremony interludes to soft entertainment during the receptions topping it off with the Who Killed the DjJ performance after dinner making everyone get up an dance! The effect Who Killed the DJ has on an audience is electrifying, and this is why Quike loves playing with Ryan, Aurelio & Roberto. The dynamic between them is second to none, and no where else will you find such a great combination of professional musicians that work so seamlessly together with a DJ.